Lindsay Lohan, Flower of American Skankhood and tabloid headline regular, claims she’s been dishonored by a recent E-Trade commercial. Team Lohan maintains that E-Trade used her “likeness, name, characterization and personality” without permission. While it’s true that most reasonable people would be horrified to be in any way associated with these E-Trade grotesqueries, it’s not clear that the use of the name “Lindsay” was intended to imply any connection with Ms. Lohan. 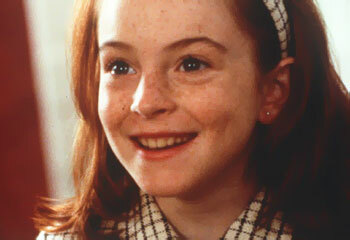 The infant in the commercial could be any skank named Lindsay. Team Lohan will no doubt respond with the trenchant counter that prior to Ms. Lohan’s use of the name, “Lindsay” was associated with virtue. Now the name is linked inextricably not only to skanks, but also to sluts, hos, tramps, ladies of easy virtue and the like. Ms. Lohan will therefore contend that any unflattering or mocking depiction of a “Lindsay” is a direct and intentional use of the former child-star’s image. Regardless of the lawsuit’s outcome, there are already plenty of losers. A generation of young women looks up to Lindsay Lohan, and to those women–the skanks of tomorrow–this news will no doubt come as a heavy blow. But like the spunky strumpet they idolize, this junior varsity Jersey Shore will no doubt face the coming challenges with characteristic élan. Look for them and you will find them: lifting up their shirts for a stranger’s camera, dressing like hookers to piss off Daddy, and that old chestnut–getting a mammoth, butterfly design tramp stamp which reads CLASSY LASSY. Lindsay may be down for the moment, but the Sisterhood of Skank soldiers on.